How to Draw ANYTHING! video update 100k views! My ‘How to Draw ANYTHING!’ YouTube video has now had over 100,000 views on YouTube. I am an incredibly chuffed artist to be able to help others learn the basics of drawing in this way via social media and the internet. Here is the video link. Enjoy & share. This entry was posted in How to Draw, The Art of Billy Blog and tagged beginning drawing, Drawing, drawing anything, drawing basics on 03/03/2016 by billy. How to Draw ANYTHING! part 1 Using Shapes. 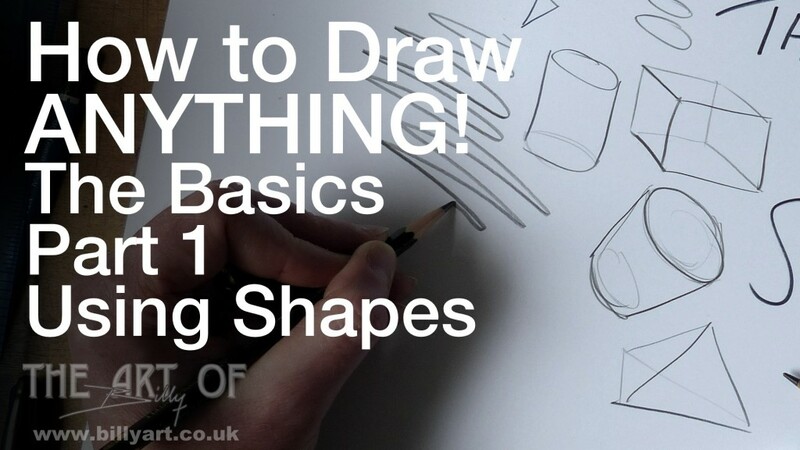 Sounds like a a grand opening but here is my entry level BASICS video on starting to draw using shapes to create the structure of your drawing of ANYTHING. By simply using boxes, rectangles, cones, cylinders and ellipses you can lay a foundation down to draw anything from a bird, a bee, a flea, a tree, a horse, a house or ANYTHING else! There are a number of videos on my Youtube channel and I regularly add new ones so this could be a great way of keeping yourself or your children busy for many hours. I hope you enjoy the video and do get doodling. This entry was posted in How to Draw, The Art of Billy Blog and tagged art lesson, art tuition, beginning drawing, drawing anything, drawing basics, How to Draw on 17/07/2014 by billy.